Cap 6-21 cm broad, convex, expanding to plano-convex; margin incurved, decurved at maturity; surface smooth to finely scaled, cracking in dry weather; disc yellowish-buff, shading to a cream-colored margin, bruising yellow slowly, especially when young; flesh white, unchanging or yellowing slightly, thick, firm, but soft in age; odor and taste of anise when fresh. Gills close, free, pale at first, then blackish brown at maturity. Stipe 4-14 cm tall, 1-3.5 cm thick, equal to tapering to an enlarged base, stuffed; surface smooth at the apex, white to cream, sometimes with scattered scales below, occasionally yellowing slowly; veil membranous, upper surface smooth, lower surface, with cream to buff, cottony patches arranged in a gear-tooth pattern, forming a membranous, superior, skirt-like ring. Spores 6.5-9.0 X 4.5-6 µm, elliptical, smooth; spore print chocolate-brown. In arcs and rings in grassy areas, e.g. playing fields, pastures; fruiting from late fall to early winter. 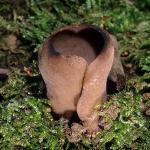 Excellent, though not as meaty as Agaricus augustus or A. bitorquis. 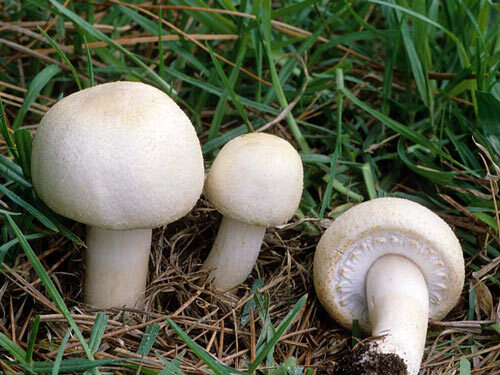 Agaricus arvensis is characterized by a cream-colored cap, free blackish gills, sweet odor (best observed in young, fresh material), grassland habit, and tendency to discolor yellow slowly when bruised or in KOH. 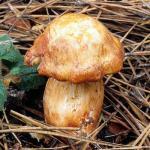 It is most likely to be confused with the more common Agaricus xanthodermus, but the latter has a whitish cap with a buff-brown disc, a phenolic odor, and bruises yellow quickly, especially along the cap margin and stipe base.